Microsoft has already dated its E3 2017 press conference. And it will take place on the Sunday before the annual event kicks off. The firm tweeted the news today, and as you can see, it will take place at the Galen Center in Los Angeles on Sunday, June 11. It will kick off at 2pm PDT/5pm EDT/11pm UK. The firm also plans to host a Fan Fest with more details to be announced at a later date. We expect it to be livestreamed as usual, and of course we’ll post any news that comes out of it. 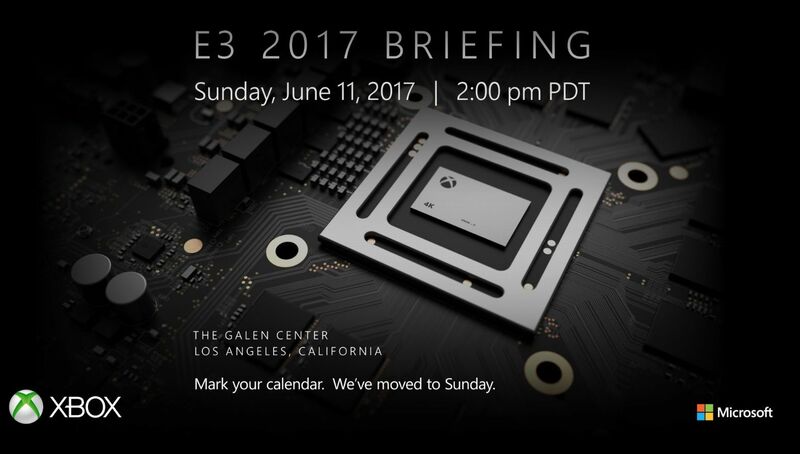 As you can also see in the image, the souped up Xbox console, Project Scorpio is being teased, so we expect the main meat of the presser to focus on it. Microsoft announced both Xbox One S and Scorpio during its press conference at E3 2016, with Xbox head Phil Spencer stating he believes Scorpio “will be the most powerful” ever. According to information provided by the company at the time, the console hosts an 8-core CPU, with a GPU capable of 6 teraflops of computing power. This would make it 4.5 times as powerful as the one in Xbox One. The firm also said the console will provide “true 4K gaming” along with “high-fidelity” virtual reality. As with PS4 Pro, all games available for Xbox One will be compatible with Scorpio, but you will need a 4K TV in order to benefit from the console. Unlike Pro, though, Microsoft’s console will support 4K Blu-rays. Last month, specs for Scorpio were outed via a leaked Microsoft document, showing the console had ditched ESRAM opting instead for memory setup which will “easily outperform Xbox One.” But, developers will have to continue supporting Xbox One’s ESRAM, because there won’t be Project Scorpio exclusives released. In May 2016, two Microsoft FCC filings for chip models 1682 and 1683 surfaced, outing both Xbox One Slim and Xbox Scorpio ahead of time. The month prior, it was revealed the company was testing new Xbox One prototypes and some production notes out of China pertaining to the console also surfaced. That’s all we know about Scorpio for the time being. We”ll find out plenty more at E3 2017, especially since it’s slated for a holiday 2017 release.